A challenging steep track with limited signage recommended for experienced walkers with navigational skills and high fitness levels. This track climbs up onto (and follows) the rocky ridge with great views of the region. 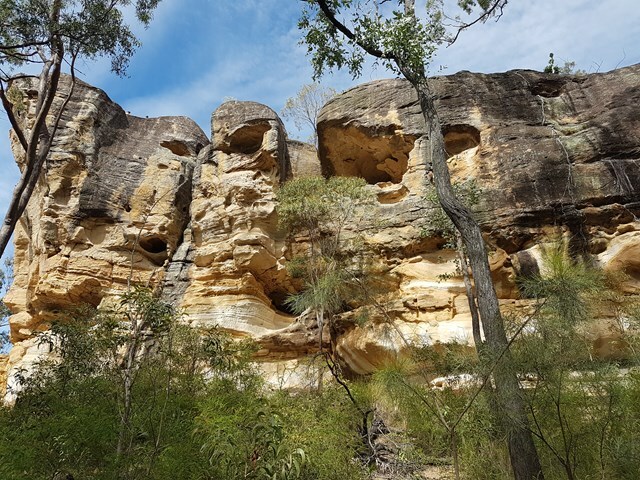 Caves and cliffs provide refuge for abundant wildlife including peregrine falcons, wedge-tailed eagles and wallabies. 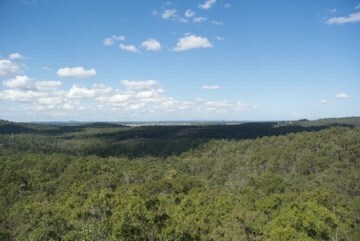 From Paperbark Flats picnic area, follow the multi user trail about 600 metres until it cuts a haul road and turns left. Signs direct you right for the multi-use trail. Rather than turning, follow the road east for another 50 metres, and there is a small sign marking the start of the ridge hike on the right. The track is obvious, but narrow and rough, and not well signed. There are no trail markers after the first couple of hundred metres, which involves a moderate climb up onto the ridge. 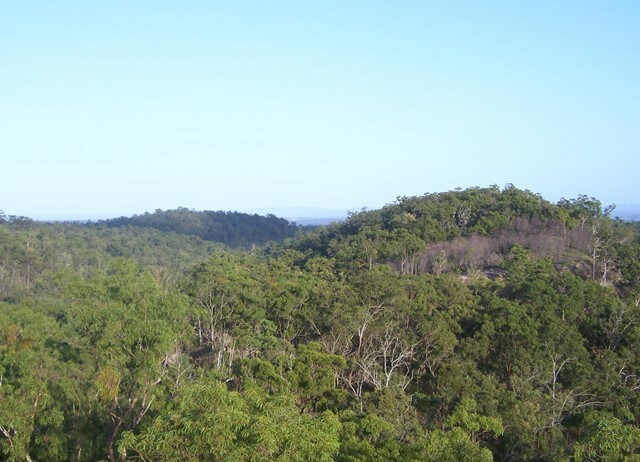 Depending on the state of vegetation, there are views to the north all the way to Brisbane. 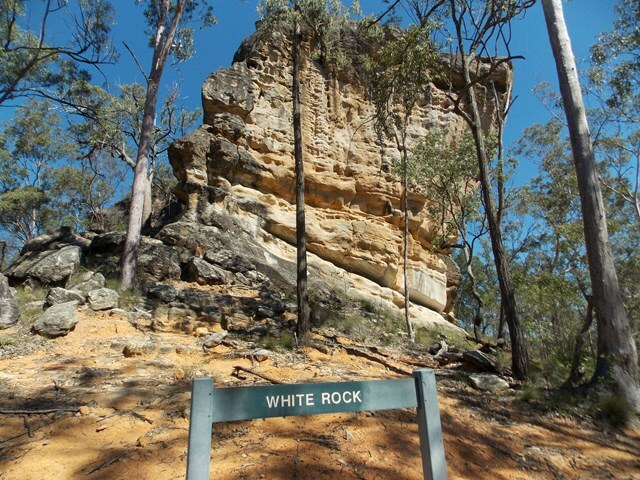 On reaching a rocky outcrop, White Rock can be seen across a col, but the track appears to peter out. Casting around to the south reveals the last trail marker, directing you down a cleft leading down to the col. 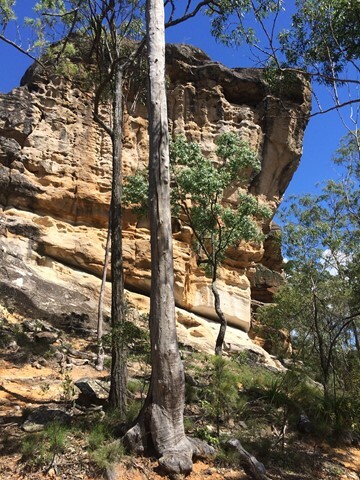 The descent is relatively straightforward, but requires caution descending the cleft. A few hundred metres easy walking to White Rock, where there are benches to rest and enjoy the peace and quiet. 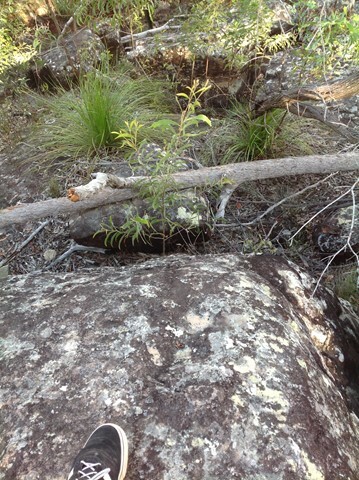 I'm just getting started into Bushwalking and found this track ok. There are a couple of areas that gets the heart pumping and the legs burning. I went on a hot day so luckily I had taken plenty of water. The track isn't marked the best in places, but I just went with the flow and found the track without any issues. Its a good starting track and would be good for the kids to do. It took me 2hrs and that was with a decent rest sitting on top of White Rock taking in the view and the breeze. Best time to do it in summer is early in the morning before the sun has fully risen. The granite easily retains heat and has no problem baking anything on top of it. 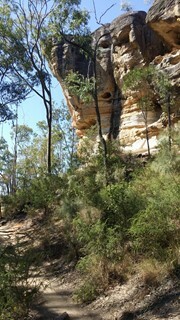 A must do is to checkout the eroded sandstone pocket on the side of White rock itself, just to the right. The track is clear to see. Whilst steep in sections, it is a lot more interesting than the White Rock Multi-User Trail. Out of respect I didn't climb White Rock but admired it from its base. A few birds of prey around. There were a few people walking mid-week so I imagine that it could get pretty busy on the weekends. A great walk. Fun to discover the little cave. Hot walking in the sun, but breezes from the top at a few points were a great reward. Some of the rock etchings are from nearly 100 years ago! Remember to pay attention to where the track splits for the multi-use trail, the multi-use trail is better sign posted and it’s easy to think that’s the path you need to take for the ridge track. 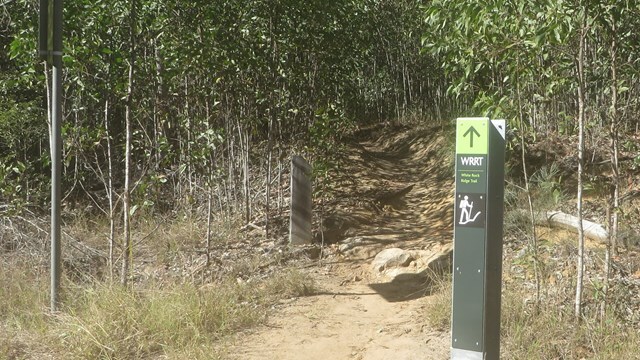 Keep to the left, there is a slightly hidden trail marker further in showing WRRT. I enjoyed doing that track first to get to White Rock. The path back via the main track is a little monotonous but you might see a monitor lizard, so listen out! I’ve seen one on every visit. 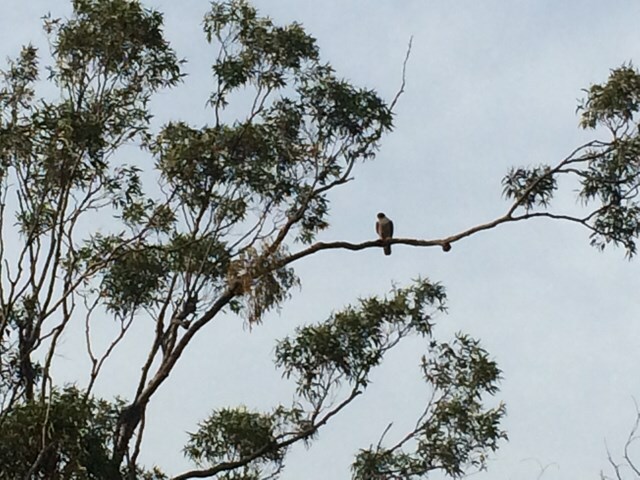 Also enjoyed the peregrine falcon perched in a tree near the back end of White Rock. 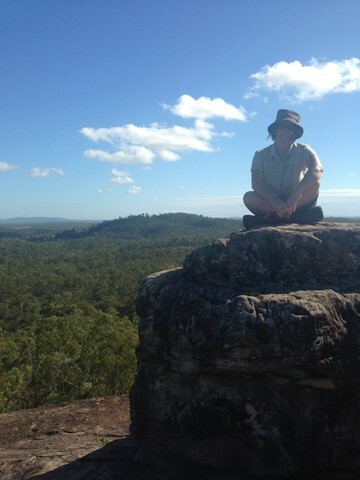 Great walk with beautiful view from the top. Did the multi-user trail on the way in and the ridge trail on the way out. Excellent view from the top of the rock and some very old dates etched into the stone. Wow holy Wow!! I took my 12 year old girl with me on this walk. It ended up totalling 7.5km. 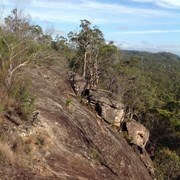 We took the White Rock Ridge Track on the way up and the White Rock Multi user trail on the way back. The Ridge track is super cool and exciting. Once you get up high you end up on top of a cliff and its easy to get confused. 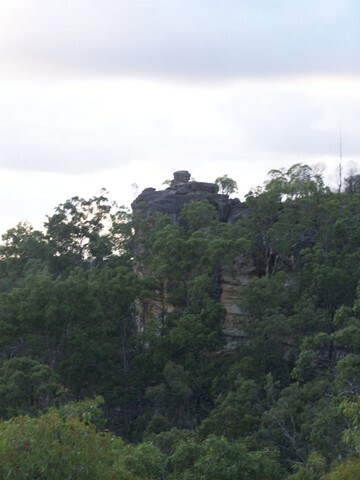 Once you find the trail and manoeuvre you way down the cliff you end up at White Rock. 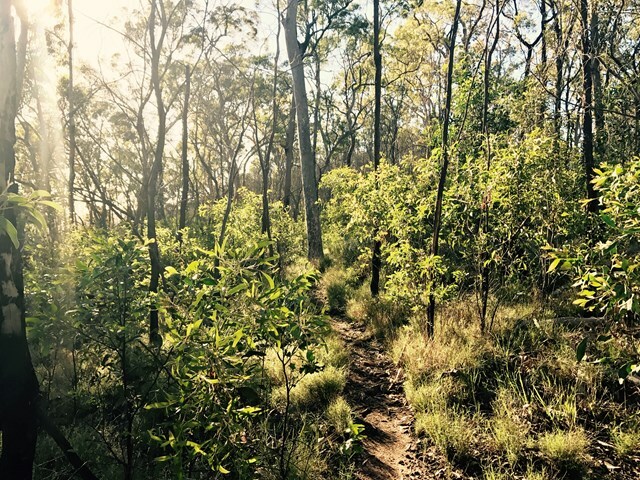 Such a spectacular bush walk and I'm keen to try the bigger trail soon. First walk for the season on a clear, fresh autumn afternoon. Well signposted now. I took the kids up via the Multi User Trail and back via the Ridge Trail. This made it really easy for them. 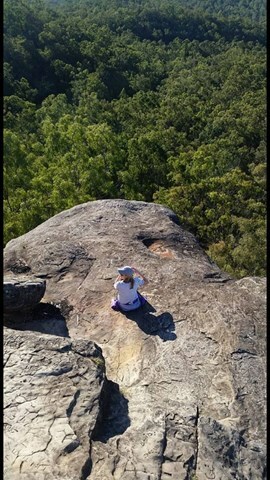 They loved the scramble to get onto the top of White Rock. The Ridge Trail was interesting with little climbs, great views and places to explore. We loved it. This is a well marked / signposted trail now and definitely a more interesting way to get to White Rock than via the multi user trail. Really pretty walk along the ridge line itself with views to the city. Cave at the end as you descend towards white rock. 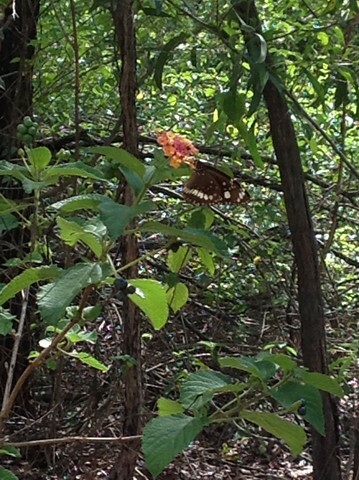 We walked in to White Rock via the ridge trail and out via the multi user trail to form a circuit. Great walk, some nice views of the city on a clear day. A small amount of rock scrambling but nothing difficult. I love this walk.the trail starts on Sandy soil with sapling lined paths.this makes it pretty with dappled sunlit track, especially nice early morning. 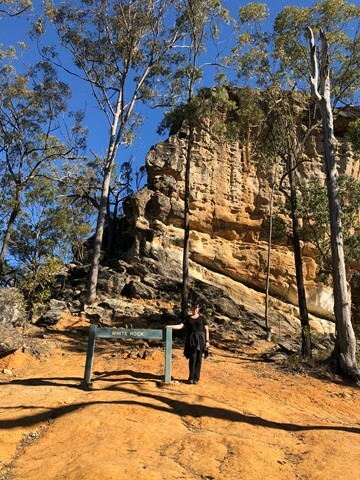 Multicoloured rocks dot the trail.on the narrower ridge the valleys are either side, cicadas singing as loud as cowbells and City was just a blur over the treetops. 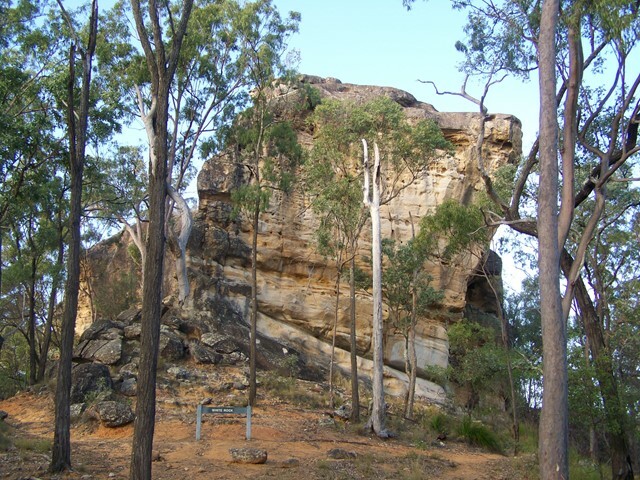 I went on to climb whiterock where this trail ends.A nice stop on ridge is under the gum on the edge, shady and high enough for beautiful views.plenty of arrows and things to grab on the rocky way down, saplings,big rocks,tree trunks.not much traffic , just a few young ones who run this at dawn, friendly and polite people. My fave place in summer.if an age pensioner can do it, you can.lovely quiet views at top. I have walked to White Rock many times. 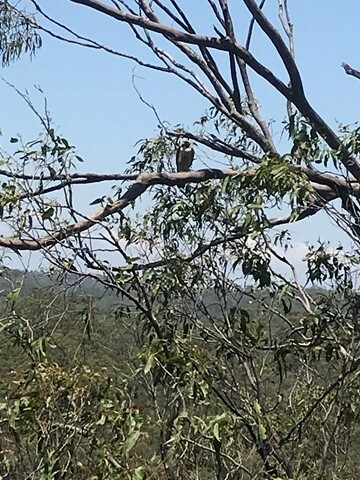 Yesterday I came back on the White Rock Ridge Track and noted additional work had been done on the track. From the White Rock end, there are now bright arrows pointing the direction up the cleft in the rock you need to climb, then again along the cliff face, at the start of the track. 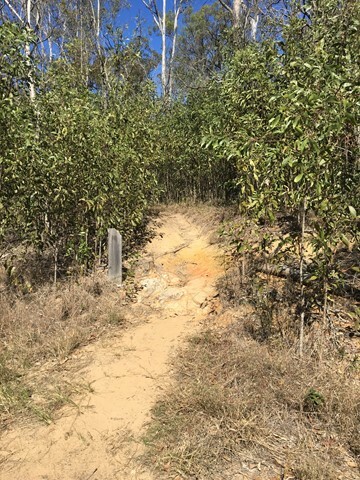 Where the Ridge Track joins the fire trail at the end, significant grading of the surface has been done for the last few hundred metres, and the eroded gullies are now a flat dirt track, even with little fallen tree barriers lining the path. I met a truck driver in the car park who told me he had been asked to deliver more dirt into the conservation estate. 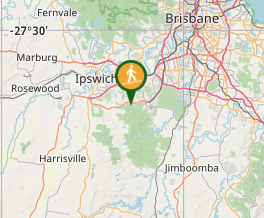 Out of interest I also took a different path up to White Rock - I walked down the Yaddamun Track, until I could take a turn-off south onto the fire trail that eventually crosses with the Ridge Track and the Multi Use Track. There is a sign at the start of this turn off which states service vehicle use only, no public access but as far as I am aware, there is no legislation to restrict access, it is part of their management plan to discourage public access to certain areas. Eventually I discovered what I was looking for - on OpenstreetMaps there is a path called 'Don't Bother'. 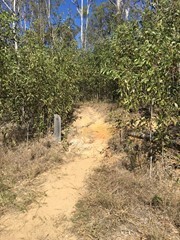 The start of this track was heavily concealed with stacked small fallen trees. There is a slight path around it to the right. The Don't Bother track was obviously a 4WD accessible track at some point but has not been maintained for a long time. 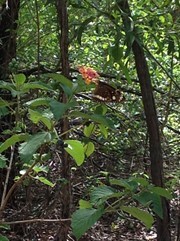 The track is eroded in many areas, overgrown with grass, and crossed by small fallen trees, but there were no real navigation issues, and no lantana overgrowth. Obviously some hikers still come this way, because there were spray-pointed pink dots on trees and grass marking the path at many points. 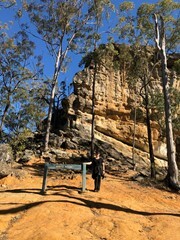 There was a steep climb up a gully at the end which emerged right next to the bench near the White Rock sign at Which Rock. Definitely a wild off-track adventure which I enjoyed, but in the warmer seasons, snakes could be a real issue. Really nice walk. The trail was straightforward and easy to follow. Not really as much climbing as I was expecting. 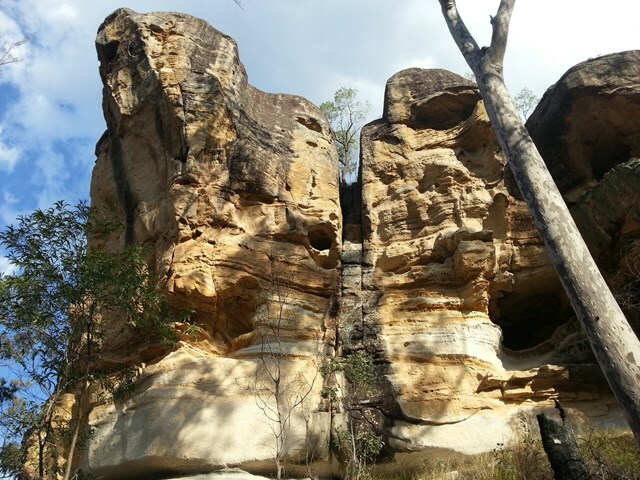 White Rock itself is quite impressive, with some nice views from the top.